Alexandra Buckle talks about her Artfinder success, finding her artistic confidence and being most inspired when dog walking! This week Artfinder met Alexandra Buckle. 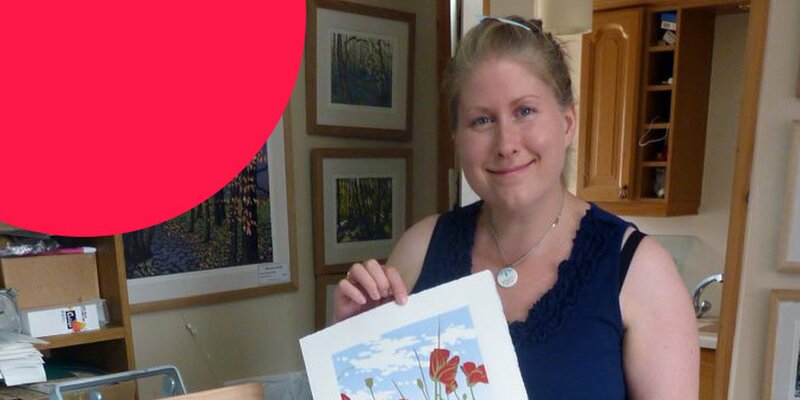 Alexandra's vibrant linocut prints are both a favourite with our customers and staff. Since joining Artfinder in November 2015, Alexandra has sold over 350 limited edition prints and gained over 2,000 followers! Her love of marvelling at the constant changes in light, weather and season is reflected in her prints of woodland walks and countryside views. "I always enjoyed art at school and decided to do an art foundation course, mostly because I wasn’t sure what else I should do and I knew I had some talent. This in turn led me to completing a BA in Design and Crafts at Staffordshire University. I discovered that I enjoyed working in metal, and ended up designing and making sculptural silver head adornment and rings. In 2004 I graduated and then began making and selling silver jewellery. I was keen to continue practising my other artistic skills and for several years I attended local painting and mixed media courses. When my teacher announced she was going to run a ‘reduction’ lino workshop, a method of relief printing with several colours, I was instantly intrigued. I had done lino printing in the past, but only ever with one colour. I attended and was captured straight away. I did several more prints at home and quickly realised that my print work was starting to look far superior to any other art work I had created up to that point, it was hugely exciting for me! I wanted to concentrate on this medium and see where it took me. Although I suspect I may return to painting at some point, I think the jewellery making is now behind me. Six years on, I am still printing and still enjoying it." "I love being my own boss. And I love being in charge of all aspects of running a business. I never was very good at doing what someone else told me to do! The more I put in, the more I get out. I like that. When I graduated I worked in a bank for a few years, I felt like I was being forced to put an awful lot of effort in and getting very little reward. Most of all I love that I get such a wonderful response from people when they see my work. It is that reaction that keeps me working and striving to improve. I’m not the sort of artist that will create and create and cares very little what others think of their work. I thrive on that positive reaction, if that stopped, I would stop, or most likely I would move on to another creative avenue." "I consider myself very lucky to have my own arty room. I do call it a studio, but in truth that word conjures up a much larger space than I actually have! I have a small dedicated room at the front of our house and I’m lucky to be right next to the utility, so I also have access to a sink which is great. A fairly new addition is a cork tile wall which I find great for pinning up my test prints so I can study them and make decisions. I have a laminate floor, which makes it nice and easy to sweep up the bits of lino and frosted glass in the window. This sounds a bit weird, but in truth the view would be rubbish anyway as the window just looks out onto the road, it lets in lots of light without me feeling like I am on show. I also have a washing line with a row of pegs to hang up my prints to dry. Of course it gets pretty untidy in there at times, particularly if I’m preparing work for an exhibition. I have to force myself to go in and tidy up as I can’t create anything when it is messy." On inspiration: Where, who, what and when? "Everything seemed to fit into place within a few months. I learned the reduction lino technique, we got a dog and spent more time outdoors, and then we moved house and I got to have my own arty space. We started to visit places with the dog that we wouldn’t have needed to go to before. Such as our local woodlands, across fields, our local nature reserve...The woods are our favourite place to go, we have been walking the dog there for over four years now and it has never looked the same twice. The weather, season and time of day all have a bearing on the colour and light. I love capturing large woodland scenes and also focusing in on the smaller details, such as mushrooms on a decaying log or a woodland flower. I remember my first light bulb moment so clearly. It was one of our very first trips to the woods, it was spring and the bluebells were emerging. I think this was my first experience of bluebells (how had I got to thirty-something without seeing a bluebell wood?). I was blown away by the bright green of the brand new beech leaves and the blue of the bluebells. I’d been practising my reduction lino skills and my brain turned it into a linocut straight away! I took a few photos with my phone and I couldn’t wait to start! That was my first of many woodland pieces." "Lino printing is a form of relief printing whereby designs are cut from a block of lino with gouges. Ink is applied to the relief surface of the block with a roller and paper is then laid over the inky block. Pressure is applied to the back of the paper, either by hand or with a press, this transfers the ink from the block to the paper. With reduction lino printing you cut and then print your first colour. You then return to the block and cut more and over print in a new colour and so on. This way a multi-coloured image can be built up and the block is destroyed in the process. It is very hard to imagine the final outcome and balance the colours. Each layer of colour you add will alter the visual appearance of the colours you have previously applied. You have to have a certain amount of faith and be ready to accept the outcome, whatever it may end up to be! I find this unpredictability very exciting. I have created a lot of reduction prints now and have learnt what works and where things can go wrong, so to keep the process exciting for me I always make sure I am taking a little risk each time. I may choose an interesting order of colours or pick something that is difficult to cut or ink, in this way I ensure that I continue to improve." "My main challenge is to find enough time to create. I work hard, I promote, I engage with my customers, and I exhibit... I’m a full time artist and I do the lot. I seem to have an incredible amount of admin! When all jobs seem important, it can be hard to prioritise the making. Often it is the last thing I get to, after doing everything else. This is an issue I battle with every week. In an ideal world, I would get some printing done every day, but this just doesn’t always happen. I start to get very uncomfortable if I haven’t created anything for a few days! It can also be hard to switch off at times when you run your own business. Sometimes I can go weeks without taking a proper day off." "As a teenager I was very lucky to go on lots of school trips, I visited Paris, Barcelona, Madrid, Bilbao, Berlin and Amsterdam. I visited galleries in all of these cities. I would love to say that I could remember the trips really clearly, but sadly some of the information has faded. The artwork at the Musee D’Orsay in Paris and the Van Gogh Museum in Amsterdam has stuck in my mind the most. My Mum also took me to Monet’s Garden in Giverny when I was young. I remember being in awe at Monet’s huge water lily panels at the Royal Academy years ago. I was a keen painter throughout my school career and I greatly admired the use and application of colour, typical of the Impressionists and Post Impressionists. The paintings I viewed during my teens then made a huge impact on me and those experiences still influence my artistic style today. This admiration of the impressionist's led me to approach my linocuts as if they are paintings, rather than designs." "Today my role models are other successful printmakers. Angie Lewin and Gail Brodholt are two artists I have been follow closely. Also, quite local to me is Japanese Woodblock and lino artist, Laura Boswell. I’m always impressed by her professionalism and her CV! I too hope to have such a long, respected and successful career in printmaking." "Everyone has advice when you are starting out. Until you begin to have any success you feel you have to listen to it all. I’ve learned to be very wary of advice. Particularly advice on what I should make/paint/print/sell. I think this is something that must be figured by your own personal creative journey, with a balance of heart and head taking control. For me there was little point in making and selling something I didn’t enjoy creating, but also, little point creating something that I couldn’t sell. I quickly learned that I was much happier when I was being true to myself. I think I suffered from people trying to pigeonhole me too early on – at school and at university. It didn’t help that I wasn’t particularly confident or decisive. I tended to let others make decisions for me about what I should do. A little success goes a long way and I am now so much more confident about what I am doing. I let people give me advice, but I decide whether to act on it or not. I also think life is generally easier if you are always nice to people!" "I joined Artfinder in November 2014. As it is free to set up, I didn’t feel I had anything to lose by giving it a go. Not much happened for a week or two and then I made my first sale! I was so pleased! And then Artfinder featured me as Art of the Day over the Christmas period and suddenly my shop went crazy! I couldn’t believe it! It gave me so much confidence that so many people were admiring and purchasing my work. It spurred me on to create more, to improve and grow. It also meant that I had the funds to purchase better equipment, this year I used proceeds from sales to buy myself a larger press so that I could tackle much bigger prints. I’m incredibly grateful for all the support I have received from the Artfinder staff and community." Alexandra in September 2015, celebrating that she had 100 linocut sales in just 10 months on Artfinder with some bubbly. "I am quite an ambitious artist. In twenty years time I want to be a household name. I am also a realistic person and realise that this probably won’t happen. I actually don’t think there is any harm in dreaming big and striving for it! I submit to the Royal Academy every year and I regularly try other open exhibitions. I try to get my artwork in front of people that might be able to make a difference. In truth I will be happy if I can continue to earn a living from my art. That was always my main goal. There is always room for improvement of course, but I am incredibly happy with how things have gone the past couple of years. I plan to once again open my home studio for the Oxfordshire Artweeks in May and take part in exhibitions for Bucks Open Studios in June, these are my ‘main events’ each year. I don’t have too many other events confirmed as yet, but opportunities pop up all the time and I’m sure I will keep myself busy. I will also continue to offer my private lino-cutting workshops, at my home. These have proved incredibly popular and I really enjoy doing them." "Keep producing work you enjoy making and keep testing the water to see what kind of response you get to it. Keep striving to improve you work. Selling online is a very cheap way to get your work in front of lots of people. If they like it and you have priced it right, it will sell. Participate in local events in your area, if nothing exists, make something happen yourself and start an artistic community. And above all, promote, promote, promote... offline and online. Make the most of social media, we are so lucky to have this wonderful free tool to reach our customers."